Last week a reader visiting Morocco sent a Twitter message, “I’m in Morocco. Marrakesh tomorrow and haven’t bought spices yet. What to get? Saffron? Paprika? Tell me, it’s overwhelming!” Overwhelmed in Morocco? It’s understandable. The sounds, souks, colors, culture, flavor and aromas…it’s collectively intoxicating. 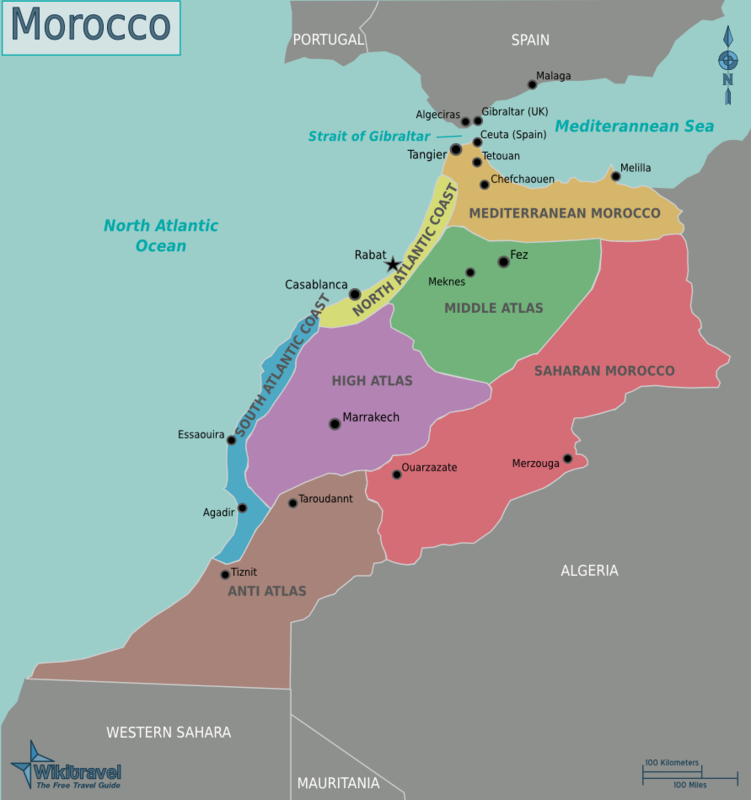 Morroco catches a steady stream of Europe’s gastronomic influence through Spain while embracing its North African geography. The sea, which borders two of its 5 (sort of) borders, certainly influences the national menu. Morocco has the distinct priviledge of claiming cooking philosophies and flavors from the Mediterreanean, Saharan and the mountains (the Atlas). Even the Romans had their say. The ancient ruins of Voulubilis are an easy drive from Rabat. Spices and the food they impregnate with their flavor are culture. Wandering through Morroco’s labrynthian spice souks are akin to letting a 5 year old loose at FEO Schwartz. So when a reader asks for Moroccan spice advice, where do you start? In lieu of creating a list of spices I did a little research on that quintessential North African spice blend: ras al hanout. Like all spice blends, ras al hanout isn’t a cloned creation. In Arabic, Ras El Hanout means “head of shop” and is a blend of a merchant’s best spices. Typically, this includes cinnamon, ginger, black pepper and nutmeg. Other popular spices are cumin, coriandor and saffron. Ras al hanout has reportedly been made with range of a few to one hundred (amazing, I know) different spices. Some unusual additions have included dried rosebud powder, cubebs, and even insects (Spanish Fly) although Morroco banned this practice in the 90’s. In ras al hanout the ingredients are toasted, blended, and ground into a powder. They flavor things like pigeon (admittedly, I passed on trying this), rice, couscous, vegetables, and fish. 8 saffron threads; 2 teaspoons salt; 1 teaspoon ground ginger; 1 teaspoon turmeric; 1/2 teaspoon ground allspice; 1/2 teaspoon ground nutmeg; 1/2 teaspoon ground cinnamon; 1/2 teaspoon freshly ground pepper. Crush saffron and salt together in a mortar and pestle until a coarse powder forms (or place on a cutting board and use the flat side of a chef’s knife to grind into a powder. Similar to crushing garlic). Combine with ginger, turmeric, allspice, nutmeg, cinnamon and peppper in a small bowl. Makes 1.5 tablespoons. Try tossing coarsely chopped vegetables with olive oil and ras al hanout. Spread on a baking sheet and roast at 375-400 degrees for 15-20 min. (Times will vary depending on the vegetables). Half way through turn them over. Serve with couscous or rice. Great post about Moroccan spices. Makes me want to eat some Moroccan (or at least Mediterranean) food! Morroco is such an interesting intersection of geography, history and food – and your article brings all that together nicely. Keep up the tasty work – Spice Sherpa rocks! Yumm to the Moroccan spice comments! I think I’ll cook up something spicy and fun for these rainy days and think of the warm, dry desert. Thanks!!! Sitting in Riyadh and one of the ladies is from Morocco and she says Ras Al Hanout is good on fish – she says “hutu juwa” which means put it inside, and then close it tight (she is motioning to sew it up!) Clean the fish first, remove the scales, clean the inside, fill with Ras Al Hanout and close the fish and then also put it on the outside of the fish, (put 1-2 spoons ras al hanout into a little olive oil and put on outside the fish). Bake til done…. I just took the ingredient list and I heading to the market. Thanks for the recipe. Wonderful! Let me know how your ras el hanout turns out, and if you add your own touch! Remember, it’s a flexible recipe and not meant to adhere to strict ingredient list. That’s what makes it fun.